Our Black / Silver Super Heavy Duty tarpaulins are heavy-weights at 270gsm. 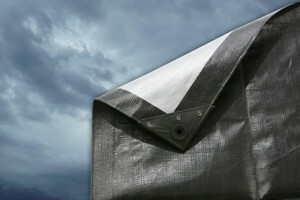 Boasting a tight 16x16 per sq inch weave count, along with chunky brass eyelets at 50cms intervals, this tarpaulin is a sturdy, durable cover, great for year round usages of all kinds. CLICK HERE for handy tips on fixing and using your tarpaulin. Currently available in 8 sizes, the Black / Silver Super Heavy Duty Tarpaulin is a great option for projects where extra strength and durability is required. 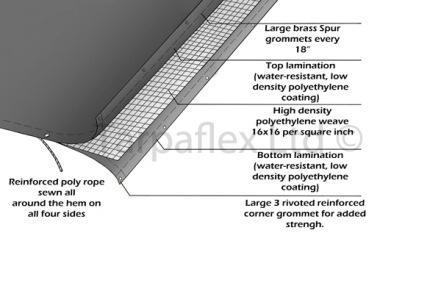 It is a popular product for a variety of uses, including industrial, agricultural and even as a simple roof cover. The dual colour provides an added advantage, recommending the sheet for uses where a black backdrop may be required, ie. in music or film sets. Furthermore, the silver underside works well as a sun reflector during the summer months.